Questions about TurtleSkin Body Armor? The U.S. Government provides up to 50% funding for the purchase of TurtleSkin Body Armor by state and local law enforcement. From engineering and testing for higher safety margins to a design based on comfort, TurtleSkin Body Armor technology is the new benchmark of performance for Level IIIA concealable ballistic vests. TurtleSkin Body Armor absorbs and dissipates more energy over a greater backface area to reduce non-penetrating injuries associated with blunt trauma to the chest and torso. 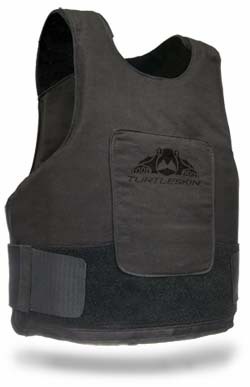 TurtleSkin Body Armor provides more comfort, concealability, and custom fit in designs for both men and women. Each armor vest is custom sized, tailored, and pre-flexed for each individual. Create a concealable Level IIIA body armor vest that delivers the most reliable ballistic and blunt trauma protection while offering excellent comfort and concealability . . . It's not uncommon for body armor materials to lose protective properties over time—and this dramatically skews initial certified protection levels. We address this life-critical issue with our proprietary Combined Cycle Accelerated Aging™ (CCAA™) protocol, which allows us to test and develop the most reliable body armor package by simultaneously accounting for the extreme environmental factors of heat, humidity, and flex endured during a product's service life. As a result, TurtleSkin Body Armor with SoftPlate™ technology offers better concealable ballistic and blunt trauma protection above and beyond standard requirements. We perform military-based ballistic tests on pre-aged and pre-flexed armor panels to ensure that the final product offers the highest level of safety for the duration of its use.